Baba Sharfuddin was not just a man of high intellect but is known to have also performed many a miracle in his lifetime. DIVINE PLANE Devotees sit around the resting place of Baba Sharfuddin in the evening. 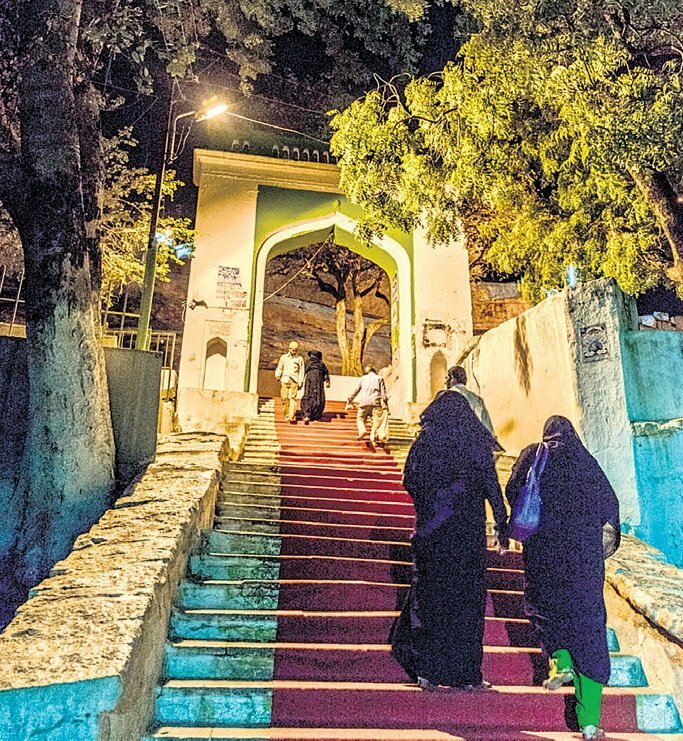 A city with a rich spiritual heritage, Hyderabad’s landscape is dotted with countless shrines. But one of the most famous shrines is that of Baba Sharfuddin. Situated at a little distance away from Maisram, the shrine of Pahadi Shareef is named after the Sufi saint. A famous Sufi saint of the Deccan, Baba Sharfuddin was born in 1174 in Iraq. He was the 13th generation descendant of Hazrat Ali and the son of Syed Mehmood Bin Syed Ahmad. While he received his early education in Baghdad, his father taught him the sayings of the Quran. He acquired sound knowledge of Islamic laws and jurisprudence from the great scholar, Sheik Shahab Uddin, and accompanied him to India. After travelling throughout the country for nine years, he finally came to the Deccan in 1229. He first visited Daulatabad and finally settled on a hill, seven miles south of Hyderabad. For nine long years, he lived in the caves of the hill. Later, he came out and spent his time among the villagers giving them lessons on morality and ethics and preached the teachings of Islam. Baba Sharfuddin was a person of high intellect and spoke in a very refined manner. He lived a simple life and was very helpful to the needy. He used to visit sick people and give them herbal medicines after his morning prayers and pray till late hours in the night. The Hindus used to consider him their ‘Mahadevatha’. Whenever they approached him with their problems, he used to advice them to pray to their god, and when Muslims sought his blessings, he would ask them to go to the mosque. He used to give lessons of brotherhood to both Hindus and Muslims from nearby villages and would solve their problems with his spiritual powers. There are many instances of miracles performed by him. One such story is that of a dhobi who lost his bull. After searching for the animal for two months, the dhobi finally approached the Baba. Sharfuddin scribbled something on a postcard in front of a deity and expressed his order. The disappointed dhobi was about to leave the temple when he saw his bull grazing behind the deity. The dhobi narrated the miracle to other villagers who started believing in the divine powers of the Baba. Baba Sharfuddin was adored by one and all owing to his gentle nature and noble ideals. He continued to impart religious teachings till his last breath at the age of 101 in 1286. On that fateful day, it is said that he came down the hill and informed people that there was a corpse on the hillock, which required last rites. People went up the hillock and saw a corpse lying wrapped in a white cloth. When the cloth was removed, they were surprised to see the body of Baba Sharfuddin. They buried him on the same hillock which came to be known as Pahadi Shareef or Baba Sharfuddin ki pahadi. As he had no children, he appointed his nephew, Syed Fareeduddin, as his successor and sajjada (care taker) of the shrine. The tomb of the Baba lies under a beautiful dome with a stone floor which is 35 feet long and 17 feet wide. Enclosed with 12 arches, the magnificent portion on the eastern side and the dome was constructed in 1942 by the seventh Nizam of Hyderabad, Mir Osman Ali Khan. There are two tombs in the shrine, Baba Sharfuddin’s grave is covered by marble and enclosed in a square, and the marble tomb is that of Hazrat Syed Fareeduddin. As the structure has 12 doors, it is also called Baradari. Adjacent to the Baradari are three arches with beautiful engravings which serve as an entrance for devotees. A beautiful mosque built by Paigah noble Khursheed Jah Bahadur stands opposite the dome. It has a large courtyard with 15 arches. An iron arch was built by one Ali Tajee, a devotee from Kurnool. Near the arch are two tanks, the western one is natural, while the eastern one is manmade. The natural tank is part of the hillock and was expanded by Nawab Memood Hussain Khan which and used by the devotees to take bath. The manmade tank was built by Nawab Himayath Nawaz Jung. At the entrance of the shrine is a two-storeyed building housing the Langarkhana (dining place) constructed by Nawab Waqar-ul-Umra where the devotees are fed. There is an imposing arch called ‘Baloji Kaman’ on the way to the shrine which was built by a butcher called Baloji Chaudary in 1880. The Asaf Jahi kings had a special regard for this shrine and stone steps were laid during the rule of Nawab Nasarudaula. Gardens were laid and settlements came up during the rule of fifth Nizam, Nawab Afazaluddaula. The sixth Nizam, Mehboob Ali Khan, was a frequent visitor who used to stay here for many days. The seventh Nizam, Mir Osman Ali Khan, provided electricity and water connections.